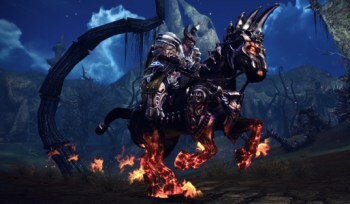 Tera players with deep pockets may now ride in serious (and seriously expensive) style. Do you play Tera? Do you have 25 bucks in your pocket for which you absolutely cannot find a worthwhile use? Then boy oh boy, do I have some good news for you: you can blow it on a horse. A fake digital horse, mind, but not just any fake digital horse. This is the Night Mare! "Tired of loping along on your bay gelding? Do BAMs laugh as you gallop past on a blue roan? Now you can strike fear into the hearts of your enemies as you charge into battle atop this gorgeous Night Mare!" the Tera blog says. "For $24.99, the Night Mare lets you take a level in badass as you ride into battle. While non-tradable and non-sellable, all characters under one account can use the Night Mare, from level one onward!" As a non-Tera player myself, what interests me most about all this is the "for $24.99" bit. Remember when the world flipped its nut over Bethesda's $2.50 Horse Armor DLC for Oblivion? Seems kind of quaint now, doesn't it? And also not entirely out of line, either; a ten percent markup to keep your shiny new horse from being mauled by the first swamp troll you meet seems pretty fair to me. On the other hand, paying half the price of the game - the standard edition of of Tera is $49.99 on Amazon - for a flashy ride is a little nuts, too. Would you do it? If the answer is yes, or even maybe, you might want to get a move on, because this flaming, four-legged bad boy is only available until June 30.